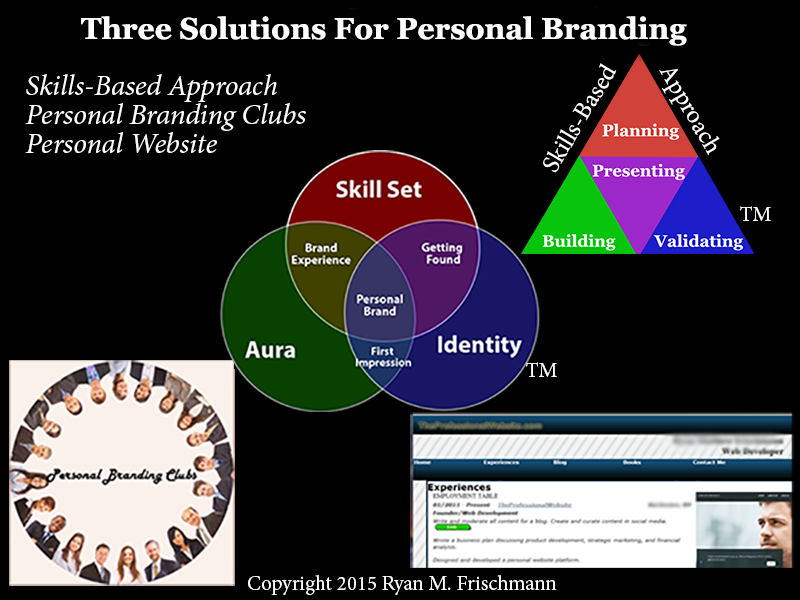 Last year I introduced a functional model for personal branding with three elements: skill set, aura, and identity. It is meant to capture a holistic picture of you. I want to provide you with solutions for each of these elements. As you work on your skill set, I suggest using the Skills-Based Approach methodology. It is a complete package. There are strategies and tools for career planning and development, constant learning, and gaining credibility – all based on the premise of developing a skill set throughout your lifetime. Create a SurveyMonkey survey, then send it to a target audience. Create a private LinkedIn group and start discussions where members talk about personal brands. What I like about a branding club is personalization. It combines a professional networking meeting (like BNI), with a social gathering (like a book club). If you are uncomfortable about asking others to respond to a series of questions about you, with a branding club, you commit to return the favor on another night. I suggest doing it within your community if you can; though logistically speaking, it can be coordinated online. The identity element is about establishing and owning an identity, then controlling how you are represented across networks. Some actions you should take to master your identity. Get your own domain name. Your domain name becomes another personal characteristic of yours, like a phone number, address, etc. The longer you have a domain name, the better it appears in search engines. It is possible to use subdomains to link to various web services. Build a personal website. This is the cornerstone of your personal brand. You want for it to appear first in a Google search. You own all the content. You control the style, aesthetics, and layout. There are no ads or distractions (unless you choose to have them). It is all about you, everything down to the pixel. Take an inventory of assets (IP). In the Information Age most students and professionals create and accumulate content, including papers, graphics, video, presentations, etc. This content is produced from education, employment, or other experiences. You should identify content that is IP, then separate what content you have control over. Figure out its value, then answer these questions: Do you want to relinquish royalty and/or copyright privileges? Should it be used on a personal website to validate skill competencies? Can it generate some income? Understand how you are represented on networks. Each of the social media platforms has an analytics platform to understand your presence on their network. (I use Twitter Analytics to see who is reading my Tweets, what hashtags are effective, etc.) There are also social media analytic platforms like HooteSuite, Sprout, etc., which are effective if you are super engaged in social media. BrandYourself is a free service you can use to monitor how you are represented on a Google search engine results page (“SERP”) and provides tools to improve the results. Establish a mobile presence. Make sure you subscribe to popular mobile apps, some are only accessible via the app itself. For example, you can only create an account for the popular app Instagram from an IOS or Andriod device. (Instagram has 300 million active users!) Mobile usage is surpassing desktop usage and it only becomes more lopsided in the future. Of course there are many other tools applicable to the Online Personal Brand model. Please share tools you find to be effective and what element it targets (skill set, aura, or identity). As I learn more about the transition from secondary to higher education, I think about possible utility in introducing a Skills-Based Approach in primary and secondary education. Previously I took for granted that it should be introduced in high school and used throughout a career. 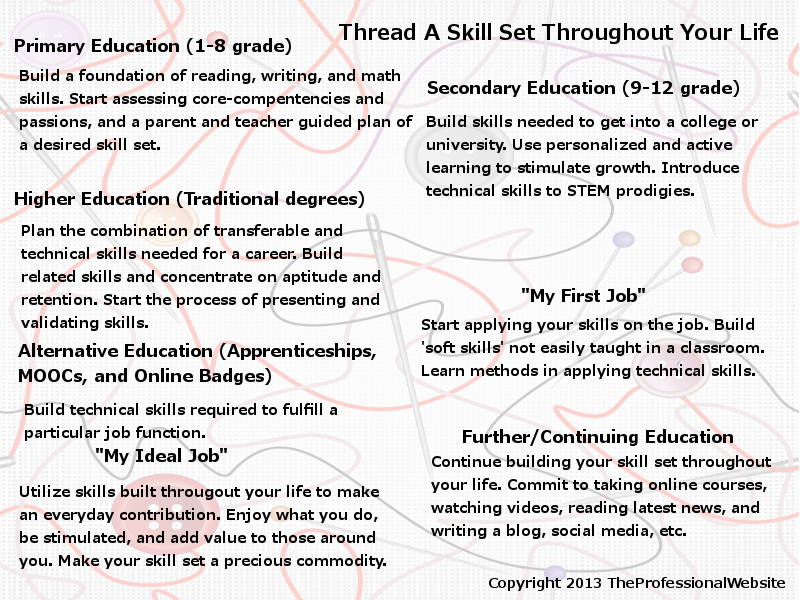 However, I think there are benefits with thinking in skill sets before high school – essentially threading a skill set throughout one’s life. The earlier you identify core-competencies, the better. If you identify a STEM prodigy at an early age, you can guide their building of technical skills based on their talents. Introduce them to engineering, computer science, or biology in middle school. Supplement their learning in the classroom (often constrained by the advancement of its students collectively), with online learning based on their own personal capabilities. Parents play a role in planning their child’s skill set. Three of the four career planning strategies of a skills-based approach are applicable for youngsters. First, identify career capital – something they can invest in throughout their life. Second, identify passions – expose children to different subjects in and out of the classroom and take an inventory of what sticks. Third, identify personality traits, interests, and values – have them take simple tests (perhaps even in the form of a game); the results are good predictors of an individual’s personal and professional development. A skill set with an assessment of the level of expertise with skills facilitates the process of active and personalized learning. (Again, educators are trying to build personalized learning into their lesson plans.) Teachers and parents review the same skill sets and design effective learning plans, which include building transferable skills (and related soft skills) – making them more transparent in a student’s development. In addition, the skill set transcends across grade levels so there is a more fluent platform to assess a student’s progress. The objective is to prepare an individual for higher education, rather than for employment. Higher education is already playing a more active role by mining for talented students, designing high school curriculums, and inspiring future prospects. All of the suggestions proposed in the building stage are applicable to a secondary education student. Probably the most important ones include: setting the stage with new teachers, finding a mentor, and using assessments to track progress. Learn more about a Skills-Based Approach by visiting the website, following it on Twitter, and/or purchasing the book. The methodology is centered on the development of a skill set throughout a career (and, as this blog suggests, your life). There are four stages: planning, building, presenting, and validating. Each stage has proposed ways to achieve its objectives. [i] Joshua Davis. “How a Radical New Teaching Method Could Unleash a Generation of Geniuses,” Wired, October 15, 2013. [ii] David G. Bonagura Jr. “What’s 12 x 11? Um, Let Me Google That,” WSJ, October 30, 2013. In her book Reinventing You, Dorrie Clark refers to a skill set as a “precious commodity”. (I like the term). It has a similar connotation to Seth Godin’s linchpin: someone who is indispensable. As you move through a career, differentiate your skill set from others within a predefined ecosystem. I am a proponent for what Mozilla is trying to accomplish; online badges ensure that every skill in your skill set can be validated and shared in professional web services. In this blog, I summarize the key themes from the “white pages article” published by Mozilla about the technology and infrastructure for universally accepted online badges. Establishing a linkage and acceptance between formal and informal learning. Building credibility so these online badges will have weight in “employment decisions, school acceptances, and self-assessments”. Validate emerging transferable skills that are not necessarily part of the curriculum in colleges. Complements skills (more precisely than a degree). Provides more context when completing a course (than simply a grade). Evolves to capture changes in technology, skills, etc. Universally accepted by professional and personal web services. Upon completion of a course, some colleges issue online badges and in the metadata provide context for the achievement – such as the teacher, score on the final test, and even a link to exam questions. Moreover, Mozilla has approached providers of free online classes (MOOCs) to consider adopting their approach. A framework of a badge is the badge itself, an assessment, and the infrastructure. An important aspect of an online badge is a mechanism where a third-party can validate badges they issue (for now, it is a combination of attached metadata and a hyperlink back to the provider). Online badges are an excellent way to validate skills for a few reasons. First, some transferable skills are difficult to validate and online badges provide the necessary context. Second, new skills and requirements are always changing so online badges are a flexible enough to validate them. Third, it is always possible to apply a one to one or many to one relationship between skills and online badges. I embrace the idea of a universal online badge system; however, there will be some difficulties. Too many providers of online badges can create redundancy and clutter. Since anyone can issue an online badge, providers can potentially collide by validating the same skills. There is a potential to become inundated with online badges. Professionals can have too many of them and it is difficult to make sense of their core-competencies. An open system for validating skills can create bogus online badges. Essentially any organization will be able to issue online badges, so some of these badges could be baseless – without any merit. Colleges have to go through a rigorous accreditation process to prove their credibility. A board member of AACSB (an organization representing the accreditation of business schools) says, “Accreditation is a signal of quality. And if you accredit everyone, it’s not a signal anymore.” With the open online badge system, anyone viewing an online badge will have to spend more time investigating the credibility of the provider issuing it. The use of rubrics has to evolve to accurately to assess skill levels. Organizations issuing online badges have to continually design rubrics that assess the skills of anyone seeking a badge. And these rubrics have to be an accurate test that cannot be duplicated or shared, and there has to a way to ensure the test is taken by the right person. Colleges have sophisticated methods to counter plagiarism and cheating and disseminate credentials (such as a report card); it is difficult to “beat the system”. Formal learning channels invest heavily in their established system and the credentials they issue will remain essential. College degrees and certifications remain an integral validation of your skill set. Most professionals will go to college and their degree will be a staple for much of their career. Security might be an issue. With the current infrastructure, it seems there might be security issues regarding hijacking and impersonations. Carey, Kevin. “Show Me Your Badge.” The New York Times, November 2, 2012. A certification is an excellent way to validate your skill set. Obtaining a certification has become more common in most professions, particularly in information technology where there are rapid changes in the adoption of applications and technologies.The advantage of a certification is bringing in a third-party to validate an expertise with a skill, and in many cases, it is done objectively – like the results of a test. Using certifications has a few benefits. First, becoming certified is a way to evaluate how well you have learned a skill when you have to learn it quickly (such as learning a new technology). For example, I learned to design websites in ASP classic but was required to begin designing websites in ASP .Net so I bought a book to learn how to code in this new language; I now want to become certified with ASP .Net to demonstrate my proficiency. Second, some professions demand a high degree of skill and require a certification to “set the bar” – lawyers must pass a bar exam in their state to practice law. Third, it can be used to demonstrate understanding of the ethics required in a profession; financial analysts must pass a series of tests before they can sell and distribute certain equities. Finally, a certification can be used for personal branding – presenting a badge makes a great first impression. It is worth discovering what certifications are available for your skill set and whether they are a requirement for careers you are targeting. Many professions have an umbrella organization that manages information about them; you should visit their website to learn about related certifications. For example, an accountant can learn more about the CPA exam by visiting the website of American Institute of Certified Public Accountants. If you cannot find a representative organization, you can utilize a search service to find available certifications. I used a service provided by CareerOneStop (sponsored by the US Department of Labor) to find a Microsoft certification for ASP .Net, for example. Certifications might have a prerequisite, such as taking a course, and usually require a significant time and/or financial investment, so it is worth investigating everything upfront. You should conduct a cost versus benefit analysis and assess your capabilities in completing the certification before making any commitment. Once you get certified, you will want to brandish a badge representing your certification on your professional website. The concept of a badge is to present and validate a skill with a simple graphic that is verified by a third-party; it is meant to function similar to a SSL certificate, where a website is verified to be secure. Badges are an excellent way to brand an expertise with a skill set. Writing a blog is an excellent way to validate a skill set because it requires for you to share insights. To write an effective blog, you commit to researching and understanding what is currently being published regarding the subject matter – you become an expert. Moreover, to add value, you must think of ways to transform your message into something new and enlightening. Demonstrating you can be creative and insightful is a powerful way to build credibility with a skill set. Think of two students who graduate with degrees in economics; one has a blog where he discusses what he has learned in his economic courses and makes interesting conclusions, and the other does not have a blog but has a marginally higher GPA. Who is going to get the job offer from an economic consulting firm? I would lean towards the graduate with a blog because I can better predict his performance; I know he can conceptualize what he has learned and develop his own perspectives. I think mid-career professionals benefit from maintaining a blog because it requires them to keep on top of their field, a good reason why it is an effective way to validate a skill set. To build a knowledge base, you need to feed on articles, other blogs, and books related to your field of expertise. Being insightful about your field demonstrates you are becoming an expert. Starting a blog is a challenging endeavor for many reasons. First, you might not have developed the skill of writing. Second, you do not know what to write about and have what is known as “writer’s block”. Third, you are wary about publishing your thoughts to a target audience because you might feel ashamed if your writings are not well received. The best advice is to start writing a blog anyway. To start out, you might not publish your blog entries on the internet or if you do publish, turn-off commenting and/or publish anonymously; you can decide to publish under your name when you are ready. I have been writing a blog for six months now. It is an ongoing commitment, but I feel more confident with my skill set each time I publish a blog entry and I am inspired to prepare for the next one. Some of these ideas about writing a blog come from Seth Godin’s book “The Icarus Deception”, where he argues we should become artists who produce valuable art – fresh insightful work; a blog can be art. Of course, the advantage in using a blog to validate your skill set is you can share your perspective. You can also use various forms of media to deliver your message in a blog entry, so it can be a more effective way to demonstrate your skill set. Students provide relevant coursework, such as papers, projects, and presentations. Because they lack employment experience, providing samples of coursework might be the best way to deliver content to potential employers; it is worth being selective by sharing only the best, most relevant pieces of work. Writers and researchers provide writing samples. They should share their work, whether it is in published form or as an excerpt. Saying you have a writing skill needs to be validated by someone actually reading your work. Web designers provide links to websites they created. A web designer must leave an impression of being tech savvy. Someone validating the skill of web design has to review a portfolio of websites. Graphic designers provide a portfolio of their concepts. Graphic designer should share a portfolio of their creations; someone validating the skill of graphic design is going to want to evaluate creativity directly. There are of course many other examples of professions that produce a work product that should be validated. The biggest impediment in providing a sample of work is if you do not own or have copyright privilege to it. For example, I designed a proprietary application while working for a previous employer so I cannot share that application to demonstrate my programming capabilities. In this case, I would rely on a reference and an explanation to validate my skills in building the application. If you are seeking employment, the most common venue to deliver a sample of work is during an interview. However, it is possible to share a sample of work in all possible mediums on your professional website so you should take advantage of this functionality; why take the extra effort of going to an interview, when the decision is going to be based on a sample of work. In addition, you provide content that you might not have been prompted to submit and in most cases, it is better to provide as much content as possible.